We are always experimenting with unique and new wood types, so don’t hesitate to inquire. You can also navigate to any specific product page in the menu above. Every new instrument which leaves our facility is warranted against defects in materials and workmanship for a period of one year. In addition, the warranty covers free bar replacement for any reason during the first year of ownership, and free re-tuning of the bars during the first two years of ownership. We only ask for you to cover freight charges in sending the bars back to us. NEW!! 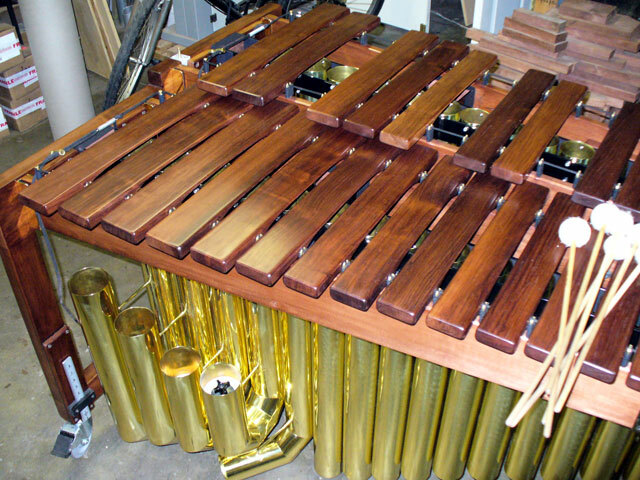 We now offer custom made marimba and xylophone covers, and we also offer a complete set of deluxe padded instrument carrying/transport bags for all of our concert instruments. The Five Octave Marimba carrying/transport bag set is a set of 12 bags altogether.